Supermassive black holes may zap galaxies into existence from scratch, new observations suggest. Astronomers recently observed a peculiar large black hole that did not belong to a surrounding galaxy as expected. Until now, scientists thought that this black hole's host galaxy was merely shrouded in dust and rendered invisible to us. The black hole, designated HE0450-2958, is located about 5 billion light-years away from Earth. 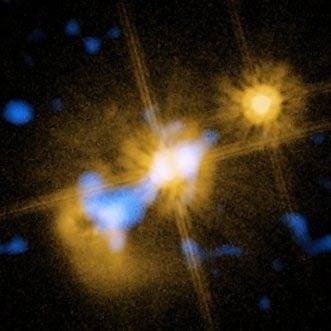 It is a type of supermassive black hole known as a quasar, which releases extremely bright jets of high-energy light. Researchers used the European Southern Observatory's Very Large Telescope to capture new observations of the quasar targeted to search for dust in long-wavelength infrared light.